Okay, I've been tagged twice (on both my blogs), so I guess I better get to it. I will not be tagging anyone else. I've never done a meme before, so this may be my one and only! 1. I can touch my nose with my tongue. 2. I like to knit at stoplights. I actually get frustrated when I don't have enough time to complete more than a few stitches! I also like to wait for the doctor if I have my knitting. Hey, it's free time to sit and knit. How often do I get that? 3. I like my kitchen counters to be clean and I wipe them constantly. I wipe after every little spill. It really bugs me to have to clean it after someone else has been cooking and there are dried spills and bits stuck to it. 4. I use chapstick all the time. I can't leave the house without it and feel panicked if I forget to put one in my pocket. 5. I love being with my teenage daughter! In the unschooling world that's not unusual, but in the mainstream world, that seems very weird. 6. I have an innate sense of direction. This is great to have since I love to travel. However, there have been a few times, when I have gotten completely turned upside down and can't tell where I am. It's extremely disconcerting. I love to read maps and will memorize street names when I get to a new place just so I can orient myself on the map. I like to know where I am. If you would like to be tagged, then you're it! 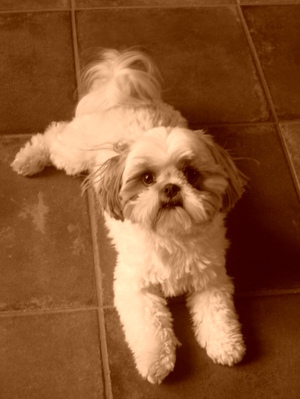 ** That picture above is just because he's so cute! We've been terribly busy again, but I've got some good stuff to show you. 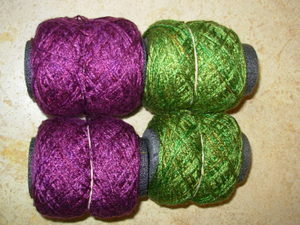 First, here are the gorgeous silk yarns I picked up at Artfibers in San Francisco. These are both 100% silk. The top photo is a line called Hana. The colors are exquisite- much richer than they appear in the photo! 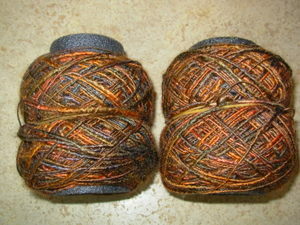 The bottom one is also 100% silk, but it's looser spun, thick and thin- it's called Golden Chai. I'm thinking special scarves for each of these. Speaking of San Francisco, I finally figured out that we walked about 7 miles that weekend, so my total so far for the 100 mile challenge is 23 miles. I've got 10 more to go by the end of the month, if I want to stay on track. 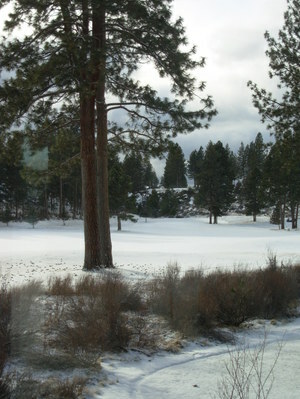 It shouldn't be difficult since we are having lots of the sort of sunny days that Central Oregon is known for. In other news, our extended family is having a baby explosion (not literally!). I'm the oldest of 10 cousins on my dad's side and the younger ones all seem to be adding to their families this year. I just found out the first babies (twin boys) were born on the 18th. They live in Australia, so I don't know when we'll get to meet them, but I'll bet they are adorable. Happy Birthday to Taylor and Kiran! I also have two other cousins due to have girls this year! What a happy time. 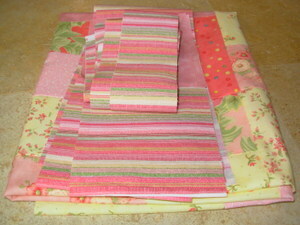 I've been busy in the quilt room and here are the piles I've made so far. 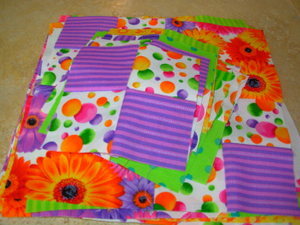 I've got another quilt project going right now, but I think it requires a separate post, so that will be coming up later. Meanwhile, I haven't forgotten about the Manos blanket! I'm working on the last bit of knitting and then the sewing up! I think the big burst of steam I had after Christmas has dissipated, but I'll try to work on that this week too. The quilting has really drawn me in and now that I have quilt and fabric piles all over the place it makes me want to get all that out of the way before working on something else. I'd like to welcome my very talented sister to the online art/craft world. She has her own website now and will be selling her gorgeous glass creations online. Check it out at Silly Dog Art Glass. Congratulations Cheryl! We had a marvelous time in San Francisco last weekend. 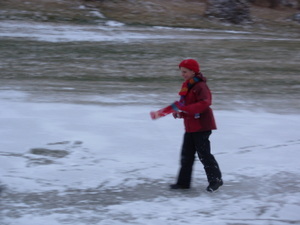 It was cold, but so clear and sparkling that we just had to spend a lot of time outdoors. 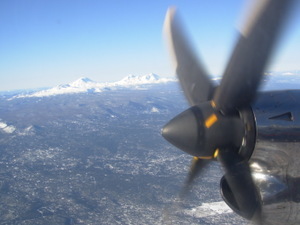 Friday afternoon started off with a flight right over the Cascades that afforded us incredible views of our local mountains. This is the Three Sisters- Faith, Hope and Charity. We got to San Francisco with time for a late lunch, then spent a bit of time walking around Union Square to see some of the galleries. 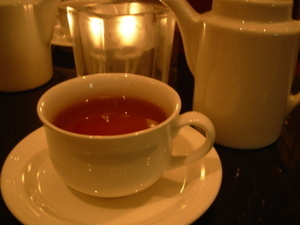 We took some time out for a cup of tea before dinner. The next morning was clear and bright and so inviting for a walk around the city. 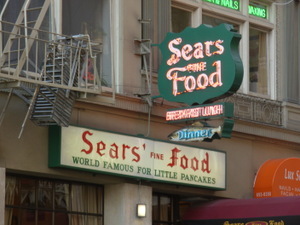 We didn't eat here, but I'd like to see those "little pancakes"! 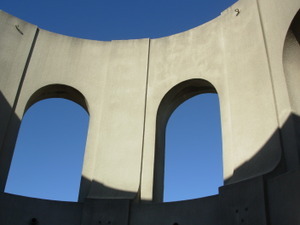 We ended up walking through Chinatown to Coit Tower. Up and down a lot of hills! 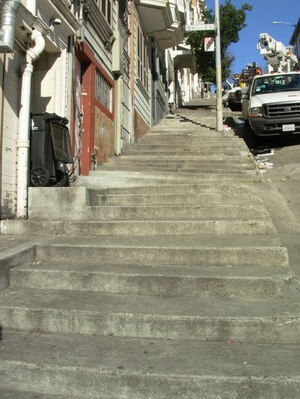 We even walked up this sidewalk made of stairs. The cable cars rode past us all over the place, but we didn't ride them at all this weekend. 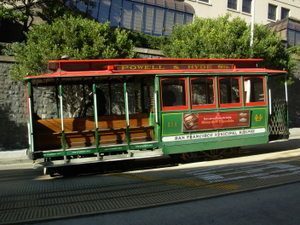 We've had many previous trips here with the kids and have taken many a cable car ride. We decided to take advantage of being kidless and do what they don't enjoy- hiking up lots of hills. 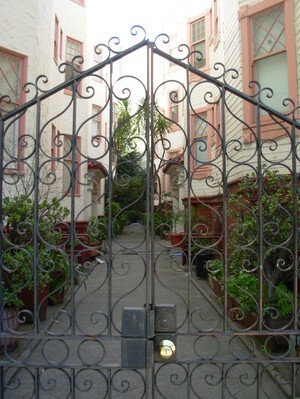 One of the fun aspects of walking a city is seeing all the little nooks and crannies. 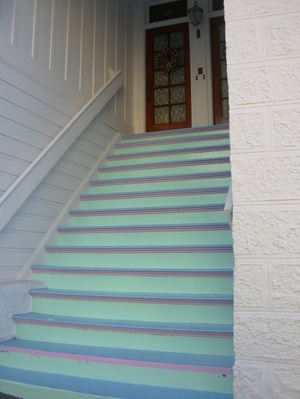 I just loved these painted stairs. 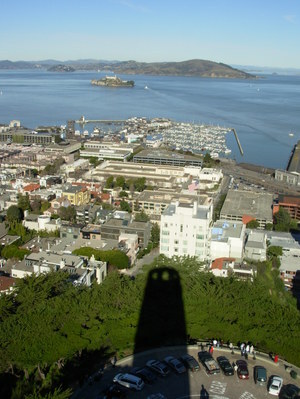 The view from Coit Tower was spectacular. This is looking north and that's Alcatraz Island out there in the bay. 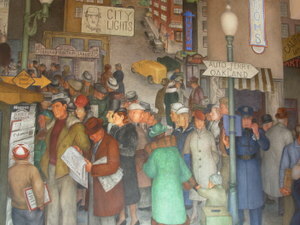 This is one of the murals inside the base of the tower. 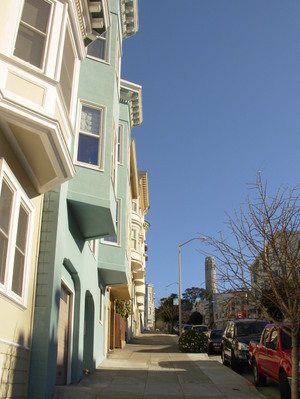 After the tower we walked several blocks over to the crooked part of Lombard Street. I'd driven this many times, but never walked up it. Along the way the pale blue of this house caught my eye. 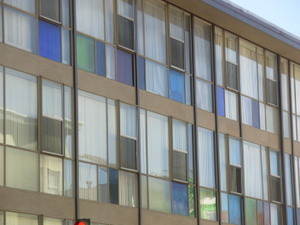 Looks like quilt squares to me! I love these little alleyways. Pausing for a bit before lunch at the Fairmont. What a great trip! We spent the afternoon looking in galleries again and have found an artist that I love. Mark likes her work too. Her name is Varya and you can see her work here. We had two marvelous dinners. One was at The Slanted Door- fabulous food! The other was Plumpjack's Cafe, which was very interesting. Some very strange dinners on the menu and they seemed to have an obsession with foam- cucumber foam, horseradish foam (I'm not kidding!). Anyway my squash soup and gnocchi were delicious and the company (old friends) was fabulous. I did make it to one yarn shop, Artfibers, but will save that for the next post. 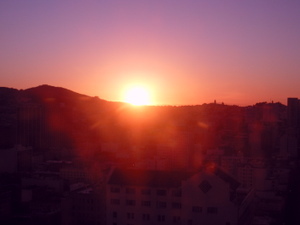 Here's the sunset from our hotel room- ahhhh! That was yesterday. 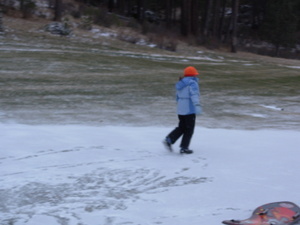 Today it actually snowed a bit! This is the same spot today. 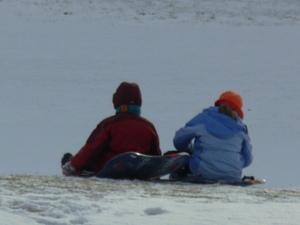 The sleds came out because if there's snow, that's what you do even if it's only about an inch! 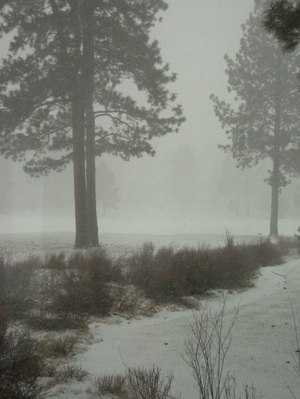 The snow came and went all day today, but the flakes were the little tiny ones that don't cover much. Here's an interesting contrast. These two photos were taken about 1/2 hour apart from each other. This is the view from my kitchen. Meanwhile, my first goal for this year, knittingwise, is to finish this Manos del Uruguay blanket. I started it probably almost 2 years ago and finished the first 5 blocks. It sat around in a drawer for at least a year. Since Christmas, I've done almost 7 more to complete it. I will be going back to redo the first one because of an error. For a long time, I thought I could live with it, but now I realize I can't! So, it'll be ripped and the first block will be grafted onto the rest. I can't wait to have this done. It'll be such a snuggly warm winter blanket! Have a great weekend, everyone. 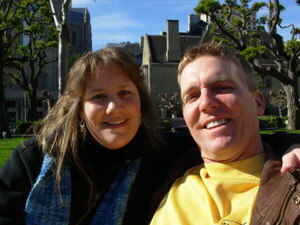 Mark and I are heading to San Francisco for a grown-up weekend and the kids are off to Grammy and Grampa's. I just joined the 100 Miles by April 1st group. You can walk, run, swim or use whatever body movement you like! I've already logged 6.7 miles since New Year's and that doesn't include our geocache walk that day. I wasn't keeping track of miles that day, but it was probably at least a mile. Anyway, click the button on the right if you want more info. I'll try to post weekly about my progress. 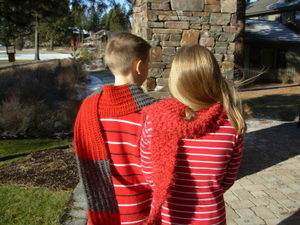 Last month I showed you this scarf as my donation for the Red Scarf Project. This week while I was cleaning my studio I came upon some more red yarn to make a very soft and fuzzy scarf and thought I might as well make another. 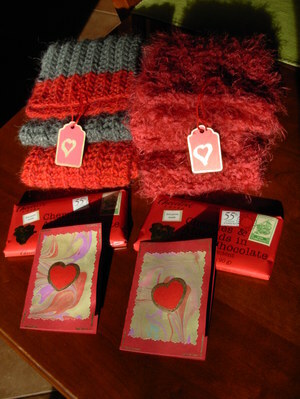 Then to dress up the package I made a couple of care tags and Valentine cards and got some of this delicious chocolate to round it out. I hope it makes a difference in these young person's lives. 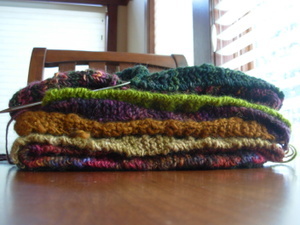 I've been doing some long overdue blog maintenance, so if you care to, check out my Knits 2006 photo album on the right. I think it's complete now. 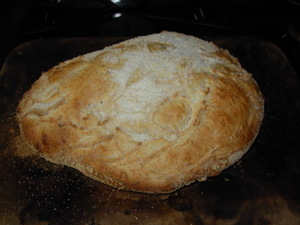 So, yesterday I was blog surfing and came upon a post about a no knead bread recipe that had been in the New York Times in November. Apparently this recipe has swept the blogging world (at least among the bakers!). I thought I'd give it a go and the recipe was still available. Here's a photo essay on the results. This is a very sloppy dough, but sooooo easy to make. 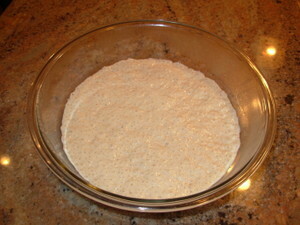 Take two minutes and mix the ingredients (3 cups of flour, 1/4 teaspoon yeast, 1 1/4 teaspoon salt, 1 5/8 cups water). That's the official recipe. I had read about the results of other bakers and decided to up the salt to 1 1/2 teaspoon. Also, it calls for instant yeast which is the rapid rise stuff. I only have the regular active dry yeast so I used it in the called for quantity and it came out fine. I made a few changes which you'll see if you compare my method to the one called for. It's delicious and very forgiving. You'll find all sorts of posts about the changes people have made and everyone loves it. Leave the mixture in the mixing bowl and cover with plastic wrap for about 18 hours at room temperature (about 70 degrees). This is how it looked this morning after about 19 hours. Dump it out onto a well floured counter and fold it over with a bench scraper a couple of times to mound it up. Cover with the plastic wrap and let it rest 15 minutes. 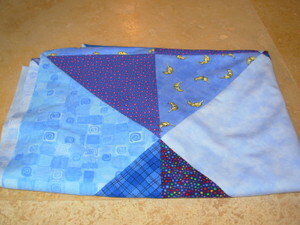 This is how it looked before I folded it. 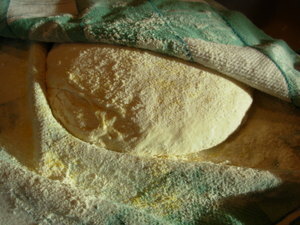 After the dough rests, form it into a ball and place on a well floured towel (mine also has some cornmeal sprinkled on it). 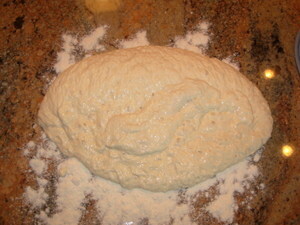 The dough is incredibly soft and sticky, so keep using your bench scraper for this and just put it on as best you can. Be gentle with the dough so you don't lose all those lovely air bubbles. Let it rise for 2 hours covered in the tea towel, but after the first hour and a half, set the oven to 450 and put in a baking stone to heat up. The official recipe calls for using a dutch oven and cooking it covered for the first 30 minutes, then taking the cover off. I had no problems with doing it uncovered on the baking stone. 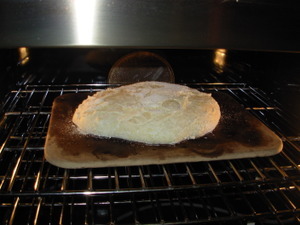 Preheat the oven and stone for 30 minutes after which time the dough should be ready to bake. Mine could probably have risen a while longer, but I had an appointment to keep and needed to bake it then. I baked this one about 40 minutes. Here it is at the beginning. Finished loaf, left to cool while running out the door. Taste test time. Everyone loved it! It's really the closest I've ever come to making an artisanal bread. 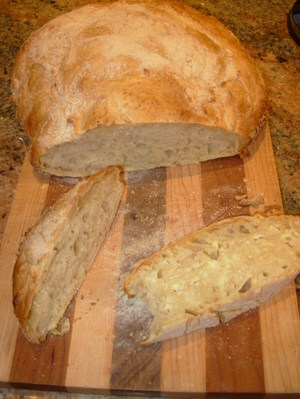 Next time I will try some whole wheat and I hope to eventually try some flavors like onion, cheese and herb. I would also forgo the floured towel and just let it rise on a floured pizza peel. I ended up using the peel to transfer it to the hot stone anyway, because, despite all the flour I put on the towel, it still stuck. Some have used a silicone mat, others have used parchment. I'll try some other ways in the next few bakings to see what works best for me. * Chloe and I love Alton Brown's show, Good Eats. I would love to see what he'd have to say about this recipe!